You might have missed this in the pre-holiday news dump, which it was specifically timed for—it's a good idea to downplay the implications of a story like this. An agreement was announced in a "hastily called news conference" to keep the Bills in Buffalo (actually Orchard Park) through at least 2020. But the real story is in the details: the Bills have been allowed to pick up just 16 percent of the costs to keep them in town. If you've ever had the slightest curiosity as to how sweetheart a deal an NFL team can possibly get, the full agreement can be read below. 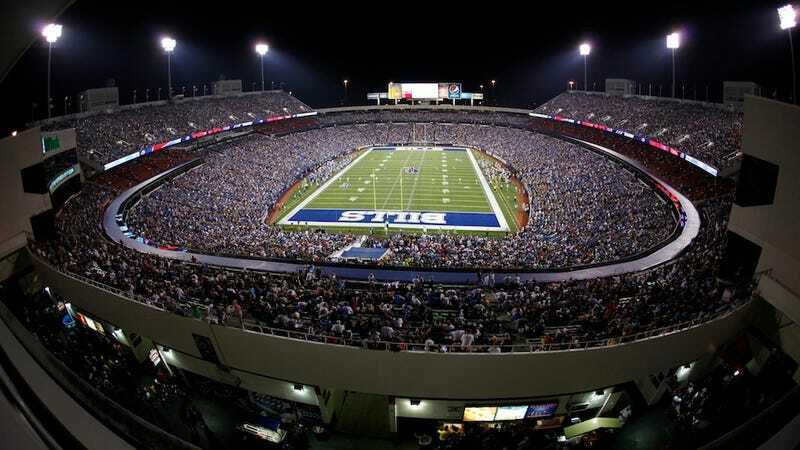 It's going to cost $271 million for upgrades to Ralph Wilson Stadium and 10 years of running the place on gameday. The Bills will pay just $44 million of that. Erie County will cover $103 million, while the state of New York is on the hook for $123 million. If that turns out to be not cushy enough, the Bills can buy their way out of the lease after year seven. We and others have railed against the outrage of public financing for stadiums for years, but it's still shocking to see in 2012 a textbook case of a community held for ransom, forced to give in to every last demand of a franchise threatening to move. Less than a year after the owners of the Rogers Centre and Maple Leaf Sports and Entertainment announced their hopes of moving an NFL franchise to Toronto, Bills owner Ralph Wilson petitioned the league to let his team be the guinea pig. Since 2008 the Bills have played one game a year in Toronto, to high-priced tickets and high attendance. Wilson has been circumspect when asked about moving the team, and the 94-year-old, in poor health, has reportedly advised his children to sell the Bills when he dies. The very public flirtation with Toronto (and the omnipresent threat of Los Angeles) has had one goal: to wring every last cent out of fearful New Yorkers. • The team store will be moved to the stadium's west end plaza, at a total cost of $2.6 million. The Bills will pay just $720,000 of that. • They're going to wire the bathrooms so you can hear live game sound while you piss. It'll cost $600,000, but the Bills are only on the hook for $164,000. • The sideline club seats will now be heated, for $970,000. The Bills only have to cover $264,000 of that. It goes on, but at this point I'm forced to point out that I live 350 miles from Buffalo. I've never been to Ralph Wilson Stadium. I'm not a Bills fan, I don't get the Bills on TV, and I've been enlisted to help pay for things that exist only to make the Bills a more valuable investment. That's the rotten core of every public financing agreement—people who don't care, who have no financial stake in the matter, who may not even like sports at all, pay out of their own pockets to help some billionaire owner get richer. You can break it down by the numbers, and it's infuriating. You think, every person in the state will owe six dollars for this. We can afford $6, but it's the principle. It's not that we are going to pay for it—we already have. The fund comes from taxes already collected by the government, without any referendum, without any say-so on where our money goes. Politicians will always argue that having a team in town is good for economics, even though there hasn't yet been a study showing that. Of course it's good for the more intangible civic health: the threat of a team moving away is very frightening, and unfortunately, very real. That's why it's hard to begrudge Western New York, or any community that spends to keep its franchise. This Bills deal might very well be in the state's interests, or in the Buffalo area's interests, or in Governor Andrew Cuomo's political interests in keeping his western allies happy—it doesn't really matter, because none of us got a say in the matter. I didn't even realize using state money was on the table, then I wake up one day to learn it's already been committed. A quiet, barely publicized financing deal like this, the legislative equivalent of loading up the moving trucks in the middle of the night, is in the interests of the politicians, not the people they represent. They believe—and rightly so—that their constituents would be far more upset by losing a team than by unilaterally committing hundreds of millions' worth of blackmail. It's really just this horrifying, evil thing, and there doesn't appear to be a line beyond which public outrage will fight back. The Dolphins are angling to get taxpayer dollars for their own stadium renovation, and they're going to hit up a South Florida community that was JUST bent over by the Marlins. Oakland, facing a budget deficit, laid off 200 police officers to save about as much money as they're paying each year to keep the Raiders. This is just business as usual. Good News, Miami! There&apos;s More Stadium Work For You To Publicly Finance. Oh, and so you know: the Bills had it written into their contract that they're still allowed to play one game a year in Toronto. 2020, and another round of public financing, really isn't that far away.